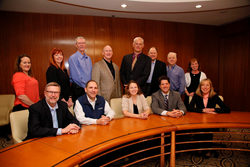 This is the 49th all-volunteer group of elected board officers and directors at large from the Radiology Business Management Association’s membership. The Radiology Business Management Association (RBMA) is pleased to announce its newly elected volunteer board members and officers for 2017-2018. The Radiology Business Management Association (RBMA) is pleased to announce its newly elected volunteer board members and officers for 2017-2018. The annual board election process has been in place since the RBMA was founded in 1968 with all board members serving on a volunteer basis. Christie James, MS, FRBMA, is president elect. Ms. James brings over 27 years of radiology practice management and revenue cycle management leadership experience, which includes working for academic and private radiology practices. She is the current president of the RBMA New England Chapter, and past chair of the RBMA Programs Committee and Payor Relations Committee. In addition, her previous service to the board includes being the board secretary and treasurer. Sarah Mountford, RCC, CPC, is the new RBMA board secretary and parliamentarian. She previously served on the board as treasurer. Ms. Mountford is a client services manager for Zotec Partners and has more than 15 years of experience in radiology billing and practice management. She is current chair of the Bylaws Committee, chaired the Finance Committee and served on the Programs Committee. Michael Langenberg, is the new board treasurer. Mr. Langenberg helps lead Association of University Radiologists, PC, in Knoxville, Tennessee. He has worked on the RBMA Alternative Payment Models Task Force, the Payor Relations Committee and the Information Technology Task Force. Mark O. Bernardy, MD, FACR, continues as the American College of Radiology director on the board. He is involved in ACR economic activities currently serving on the ACR Coding and Nomenclature committee and chairing the ACR Managed Care committee. Joining the board as new directors at large are Thomas Greeson, JD, MBA, FRBMA, Charles McRae, MBA, and Shannon Wilson. Mr. Greeson, JD, MBA, FRBMA, is a partner at Reed Smith LLP in McLean, Virginia, where his law practice focuses on the regulatory and transactional needs of diagnostic radiologists and imaging centers nationally. He is a Fellow of the RBMA and has received the RBMA’s Calhoun Award and President’s Award. Mr. McRae, MBA, helps lead Columbus Radiology Corporation in Columbus, Ohio, with expertise in data management, analysis, and modeling. He has previously served on the RBMA Board, as well as serving as chair of the Radiology Integrated Models Task Force. Ms. Wilson specializes in physician and hospital relations and business development and helps lead Bay Medical Management in Walnut Creek, California. She is currently the co-chair of the RBMA Programs Committee, and also serves on the Communication Committee. Mr. Gonzales, FRBMA, helps lead PBS West in Reno, Nevada, and has expertise in revenue cycle management. He previously served on the RBMA Board in 2009-11, and is a past president of the California Chapter. He is the past chair of the Bylaws Committee chair, and has served on numerous RBMA committees and task forces. Ms. Hamilton helps lead West County Radiological Group, Inc., in St. Louis, Missouri, and has special expertise in human resources. At RBMA, she has participated on the Membership Committee and is current chair of the Educational Materials and Products Committee. Ms. Kroken has served on numerous RBMA committees and helps lead Healthcare Resource Providers in Lewisville, Texas. She is an expert in revenue cycle management, process improvement and medical billing. Founded in 1968, the Radiology Business Management Association is a national not-for-profit association providing members with applied business information and intelligence applicable in any radiology setting. RBMA represents more than 2,300 radiology practice managers and other radiology business professionals. Its aggregate influence extends to more than 24,000 radiologic technologists and 26,000 administrative staff and physicians. RBMA is the leading professional organization for radiology business management and is recognized for its radiology-specific educational programs, products and services, publications and data. The resources and solutions RBMA offers its members and the broader health care community are helping to shape the profession’s future.